Serving the Community since 1944, Polk Medical Center is a 58-bed, acute-care facility located in beautiful Cedartown, Georgia. Cedartown, the county seat of Polk County, is located approximately 45 minutes from Atlanta and 25 minutes south of Rome, Georgia in beautiful North Georgia. 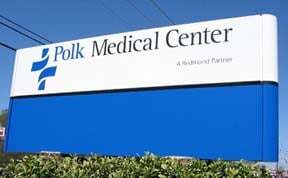 Fully accredited by the Joint Commission on the Accreditation (JCAHO), the facility is the sole hospital in Polk County. The hospital has a medical staff of 12 primary care physicians and a number of specialists and consultants. The hospital is also supported by as staff of approximately 100 employees.